Review Fix chats with playwrights Ilanna Saltzman and Heddy Lahmann-Rosen about their newest production “Amelia and Her Paper Tigers,” currently running at this year’s Midtown International Theatre Festival in New York City. Saltzman and also Lahmann-Rosen discuss their excitement at being a part of the festival as well as their creative process and what makes them unique playwrights. Ilanna Saltzman: Amelia and Her Paper Tigers was propelled into being by the many inspirational women in our own lives and those that have inspired us along the way. It goes without saying that the inspirational legacy of Amelia is at the heart of this show and is ultimately the driving force behind its creation. We wanted to explore and share her story with young people in a playful and accessible way. Heddy Lahmann-Rosen: This show has been a tireless collaboration between the two of us and some amazing artists that have contributed their time and talents toward bringing this piece to life. We made a ton of discoveries with our director Gretchen Van Lente, who is a creative genius. Our script writing process was ongoing throughout our work with her; as new discoveries and better choices were found, we would go back to the script and make adjustments. Saltzman: Well, there’s two of us, first of all. Secondly, I’d say the majority of our play was written through exploration first, then by attempting to write and rewrite something down. We sort of started with the play from the big picture perspective. After we had a broad outline, we delved into the details. We would say, “Okay, write a scene for next week. From any part of her life.” And we would both bring in scenes that complemented each other. It was very organic. Review Fix: If this what you always wanted to do? Saltzman: This piece is particularly dear to our hearts because we got to create it from scratch. We played all of the roles along the way: playwriting, acting, collaborating with our director on how to use the space, marketing, costume design, you name it. Lahmann-Rosen: Nobody has the power. We are truly a communist cast of two. Lahmann-Rosen: I’ve learned that just when I think I’ve got something figured out, that this one interpretation is the best interpretation, that’s when I have to completely surrender and be willing to throw it away and try something completely different. Being willing to try something that I don’t think will work and fully embrace it during the trial process has been an incredibly humbling experience for me. I’ve been proven wrong over and over again, and made so many exciting new discoveries along the way just by being able to let go. It’s so challenging and so rewarding! One of the hardest parts of this process for me (Ilanna), was finding an ending. 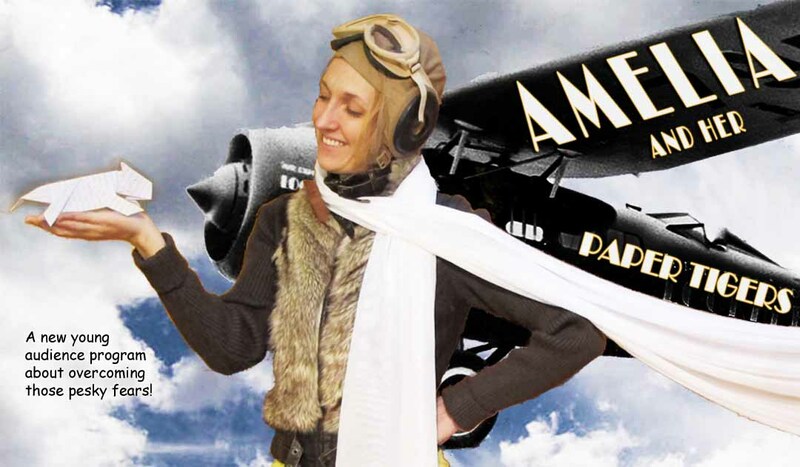 How to end a children’s play about Amelia Earhart?! You need it to be uplifting but truthful, imaginative but clear. It took us a long time to figure out an ending we were both happy with. I’ve been constantly reminded that frequently you can’t have all the answers at the beginning. Stories take time to develop; you can’t rush them. Saltzman: We’re excited to be just one of two children’s theater pieces in the festival! Theatre for young audiences can be tricky because sometimes people dumb down an idea or sacrifice creativity and insight for mass appeal. We think children’s theatre can be so much better than that–it can be a space for families to together explore and foster new concepts and whimsies. Theatre is an amazing way to open your family or students up to a new idea. Lahmann-Rosen: We’ve been re-writing, adapting, and workshopping this play for almost two years! We’re both excited to finally have a solid piece we’re both proud of. We want this show (and this festival specifically) to finally bring Amelia’s story, as we see it, to the widest crowd. We want to broaden our audience reach and tour Amelia to schools, libraries, and other children’s centers. Saltzman: Future aviatrixes. And their brothers. And their parents. And anyone who has ever had to confront an obstacle. Oh! People who aren’t scared of heights. And, well, also people who just are… Guess there’s something here for everyone! Lahmann-Rosen: We want to keep our production as relevant as possible. New discoveries concerning Amelia have been made in the past year. Some of the songs we spoof are less popular than they were when we began. Although we’re tempted to tie Amelia down to what’s already on the page, this isn’t really a production like that. It’s a blessing and curse to be both actor and playwright because the script-fidgeting is never over.